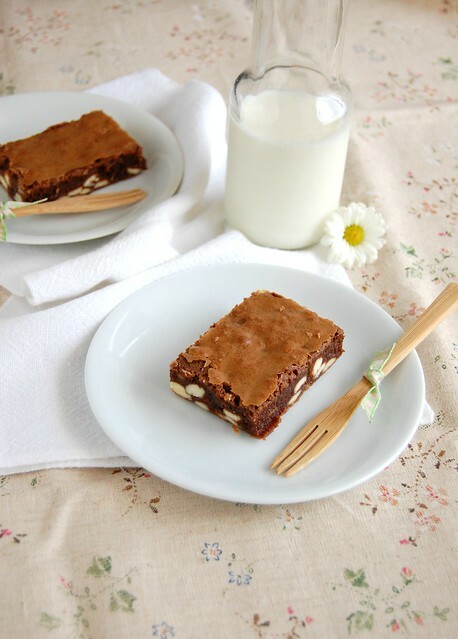 My idea was to bring brownies to work but had so much to do I was running out of time to actually bake them – that was when I turned to the cookbook for all things sweet , which I have baked very delicious things from. When I’m pressed for time and can’t go to Eat Your Books or flip through my cookbooks I go straight to Bon Appétit Desserts and up until now I have been extremely happy with that. These brownies are easy, the recipe calls for simple ingredients that are mixed in one saucepan and you can even make them without the white chocolate – that was something I added to jazz the brownies up a little. Totally optional – and a hit with the coworkers. Preheat oven to 180°C/350°F. Line a 32x22x5cm* (13x9x2in) metal baking pan with foil, leaving overhang. Butter the foil. Stir dark chocolate and butter in heavy large saucepan over low heat until melted and smooth. Cool 15 minutes. Whisk in sugar and vanilla, then whisk in eggs and salt; stir in flour just until absorbed. Stir in the white chocolate chips. Spread batter in prepared pan. Bake brownies until tester inserted into center comes out with moist crumbs attached, about 20 minutes. Cool in pan. Oh, I love the white chocolate chips here - what a nice touch. Have a great weekend! I wish I worked with you so I could taste those brownies :). Tesei, I hope you use that cookbook as much as I do - thank you for letting me know that! Joey, wouldn't I love having you around, darling! Lemon and cardamom cake + "50/50"